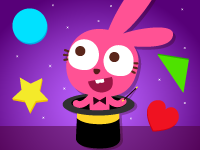 Purple Pink the Magician Bunny is on her way to the magic show. Lots of fun things happen on her way, and the shapes magic will help her get through everything! This game is tailored for the preschool kids. Guided by the magical story and the adventurous events happened in each level, kids could learn basic shapes and distinguish different colors. The learning process is fun and easy! The game play is also very easy for kids to start with: match the shapes with correct shapes and colors. Whether in the mystery forest or in the deep sea, there are various missions waiting: get a carrot vehicle assembled for the trip, help a bear craving for honey, dance a little bit along with a shell disco machine, and create a submarine for your Papo friends!